Manchester City thrashed relegation-threatened Sunderland but home substitute Vincent Kompany limped off soon after his return from injury. City will be concerned by the second-half departure of skipper Kompany, just minutes after coming on, having missed the previous eight matches with a calf injury. The defeat leaves Sunderland still five points adrift of Premier League safety, while City remain in third place. The strongest in the league? Manchester City may have lost to Arsenal last time out, but manager Manuel Pellegrini was adamant his side - when fully fit - are the strongest side in the Premier League. Sunderland did little to test that theory as they allowed Pellegrini's men to return to winning ways in totally dominant style. While just too good to handle as an offensive unit, the hosts were still far from convincing defensively as the Black Cats created several chances of their own. And when Borini scored at the second attempt from close range, it meant City had failed to keep a clean sheet for an eighth successive match. Many questioned Manchester City when they spent a club record £55m on Wolfsburg midfielder De Bruyne in the summer, who was unable to make an impression during an earlier two-year spell at Chelsea. It increasingly looks like good business as the Belgian created chances almost at will from the right, and linked up effectively with midfielder David Silva - who was brought down for the penalty. De Bruyne whipped in a delicious cross for Sterling's opener before a similarly accurate delivery allowed Bony to head home City's third. He rounded off a stunning individual display with a cool finish of his own and, had it not been for some wayward Bony finishing, the win could have been even more emphatic. What hope for Sunderland's survival chances? When Sam Allardyce was appointed Sunderland boss in October, the Black Cats were second-bottom of the Premier League and winless in their opening eight games. Things have improved - slightly - after three wins since, but they remain in 19th and have now lost their past four league matches. A defeat at City won't be the result that sends them down but the ease with which they were torn apart defensively will be a huge concern for a manager who prides himself on organisation. Manchester City manager Manuel Pellegrini on Vincent Kompany's injury: "Yes, it is the calf. Nobody understands. He had a good warm-up, he was working during the week with normality. It is difficult to understand. The most important thing is to understand why this happens. "Nobody wins the title in December, but it doesn't mean it will be easy to beat Leicester. In the second half of the season we have to play teams around us. It is important to try to continue with this kind of performance." "We started slowly. We have been trying to get the players more organised and more resilient so they can play their way into the game. The only way you can do that is not concede an early goal, particularly away from home. "Now it is three wins in nine and six losses, we are in the bottom three again and that puts pressure on us and hopefully we can ease that in January by getting new players in. "We lack consistency. We do OK in possession but it is what we do out of possession. Our position won't be determined by what we did at Manchester City but you want to see a bit more fight than we saw today." Manchester City travel to Premier League leaders Leicester City on Tuesday, while Sunderland who entertain Liverpool on Wednesday. Match ends, Manchester City 4, Sunderland 1. Second Half ends, Manchester City 4, Sunderland 1. Corner, Manchester City. Conceded by Sebastián Coates. Attempt missed. Sebastián Coates (Sunderland) header from the centre of the box is too high. Assisted by Jordi Gómez with a cross following a set piece situation. Attempt saved. Wilfried Bony (Manchester City) right footed shot from the right side of the box is saved in the bottom right corner. Assisted by Kevin De Bruyne. Offside, Sunderland. Sebastián Coates tries a through ball, but Duncan Watmore is caught offside. Attempt missed. Wilfried Bony (Manchester City) right footed shot from the centre of the box is too high. Attempt saved. Kevin De Bruyne (Manchester City) right footed shot from outside the box is saved in the bottom right corner. Assisted by Raheem Sterling. Attempt missed. David Silva (Manchester City) left footed shot from outside the box is high and wide to the left. Assisted by Kevin De Bruyne. Attempt missed. Sebastián Coates (Sunderland) header from the centre of the box is too high. Assisted by Adam Johnson with a cross following a set piece situation. Jeremain Lens (Sunderland) wins a free kick on the right wing. Substitution, Sunderland. Duncan Watmore replaces Danny Graham. Substitution, Manchester City. Martín Demichelis replaces Vincent Kompany because of an injury. Danny Graham (Sunderland) wins a free kick on the right wing. Penalty missed! 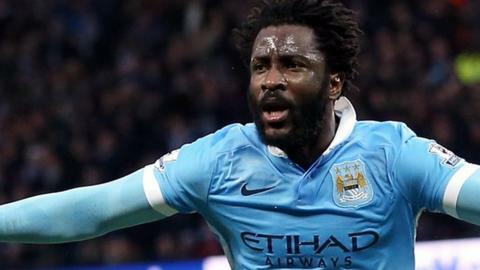 Bad penalty by Wilfried Bony (Manchester City) right footed shot is too high. Wilfried Bony should be disappointed. Penalty conceded by Sebastián Coates (Sunderland) after a foul in the penalty area. Corner, Manchester City. Conceded by Billy Jones. Wilfried Bony (Manchester City) wins a free kick in the attacking half. Substitution, Sunderland. Jeremain Lens replaces Steven Fletcher. Substitution, Manchester City. Fabian Delph replaces Yaya Touré. Substitution, Manchester City. Vincent Kompany replaces Nicolás Otamendi. Adam Johnson (Sunderland) wins a free kick in the defensive half. Goal! Manchester City 4, Sunderland 1. Fabio Borini (Sunderland) left footed shot from the left side of the six yard box to the bottom left corner following a corner. Attempt saved. Fabio Borini (Sunderland) left footed shot from the centre of the box is saved in the bottom right corner. Assisted by Lee Cattermole.